In about half an hour I’m heading out to the airport to pick up my sister and her husband. Tomorrow, their son and his wife and child will arrive. In the morning my dad is coming over to cook breakfast. On Thurday, Cameron’s mother, brother, sister in law and their daughter are joining all the rest of us for dinner. It’s going to be a full house for Thanksgiving. I’ve got a menu on paper, my dad is helping with the cooking, and I got some of the prep work out of the way today. I got a pecan pie and the cranberry sauce out of the way, and the pumpkin roasted and pureed for a pumpkin pie. After picking up my sister from the airport, I’ll start the kahlua pulled pork and later tomorrow I’ll put the turkey in the brine. 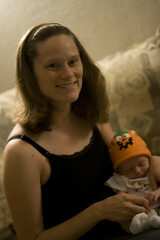 I’ll be sure to take lots of pictures of Logan’s first Thanksgiving. Until then, here’s the cranberry sauce recipe I developed this afternoon. This should hold you over for a few days. Zest and juice the orange. The orange should yield about 1/4 cup of juice. Wash and pick over the cranberries. Add the water, wine, orange zest, orange juice, sugar, maple syrup, crystalized ginger, to a sauce pan. Toss in the sprig of rosemary whole. Boil over medium high until the sugar is dissolved. When the sugar is dissolved, add in the cranberries and continue to boil for 10-13 minutes. Don’t boil any longer than 15 minutes as the pectin will start to break down. The Cranberries will pop, you may want to use a splatter screen. Remove from heat. Remove the rosemary and discard it. Cover the pan and allow to cool completely. Use immediately, or save in the refrigerator for later use. The Bumbo Baby Seat looks a touch ridiculous. Somewhat like a cross between a giant sized cartoon tooth and a candy left in the sun too long it appears more like a set piece for a Disney film than any household object. Made of soft foam it has a deep cavity for an infants bum and two smaller openings for the legs. It’s designed to support the infant’s back and gently grasp their legs, securing the child into an upright seating position. 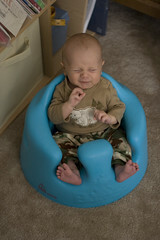 As soon as the infant is able to hold their head up, they can sit in the Bumbo Baby Seat, just like a big person. It’s unclear from the website or literature just what benefits the child is supposed to receive from using the Bumbo Baby Seat, other than an upright seating position. The website seems to promise smiles, super fun playtime, and increased communication with your preverbal infant. Logan seemed to enjoy it. We popped him in, and after a quick look around, he did what any comfortable man does when seated upright in an appliance chair. He scrunched up his eyes and had himself a nice big poop. From my vantage point, he appeared relaxed and at ease. Surely that’s a positive product endorsement. Like the Baby K’Tan, the Moby Wrap is one those new fangled baby products based on a design that is literally thousands of years old. Both are made of cotton, feature wide weight supporting straps, can be worn in a number of ways, support multiple positions for the child, and support the child firmly while freeing up your hands. The major difference between the two is the construction. The Baby K’Tan is two loops of fabric joined by a smaller one and it loops over both shoulders and in front of the chest like a cotton pretzel without salt or cheese sauce. This means that it’s sized for the wearer. My wife is tiny, and I am not. We can not use the same Baby K’Tan. 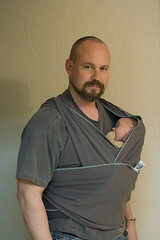 This is wear the Moby Wrap is different. The Moby Wrap is a single lengthy piece of fabric that you loop and wind over your shoulders and around your waist and tie utilizing any simple knot you can remember from Webelos. It is, literally and without hyperbole, eighteen feet long. It’s a little bit intimidating at first. Fortunately the Moby Wrap came with detailed instructions featuring photographs of pleasant looking people demonstrating step by step how to bind yourself up like a mummy. Because it’s a single length of fabric, both my wife and I can use the same wrap. I was dubious that it would work effectively, and I remarked that it was not the kind of thing I’d want to try and don in a windy parking lot. How would I, hazy with lack of sleep, be able to remember how to do this? 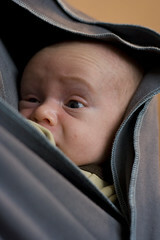 After only a few attempts I was donning the Moby Wrap like a pro. Within a matter of days I had acquired the skill so well that I’m sure I could wrap up a lunging black bear. 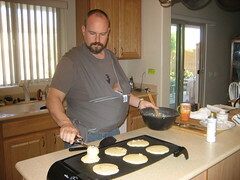 Using the Moby Wrap, I can pop Logan in and have both hands free for essential father tasks like; taking the garbage out, writing blog updates, playing video games, and making pancakes. Whisk together in a mixing bowl the flour, sugar, baking powder and salt. In a separate mixing bowl whisk together the milk, cream, butter and vanilla. Zest the orange into the milk mixture. Juice the orange and whisk .25 cup of the juice to the milk mixture until well combined. Pour the wet ingredients over the dry and whisk gently until just combined. Lumps are okay. If you whisk the mixture too much, gluten will form and your pancakes will be tough and rubbery. If that happens, let the batter sit for 10 minutes before continuing, this will allow the gluten to relax slightly. Gently fold the cranberries into the batter. Drop batter by large spoonfuls onto a hot greased griddle for the size of pancake you want. Flip the cakes when bubbles form in the center. I keep telling myself that a little sleep deprivation is nothing I can handle. After all, I did spend an entire summer and fall in Army basic training, Advanced Infantry Training, and Airborne school. It was nearly nine months of 4 hour nights and 20 hour days. “Surely I can handle a few short nights with a baby.” I say to myself. That was a hard thing to hear, even from myself. I didn’t talk to me for a few hours. I just had to get away from myself. I was afraid I might punch me. Sometimes I just don’t get along with me very well. Once I calmed down, I realized I had a point. I’m not as young as I used to be. So I started sleeping in the guest room. Problem solved! “Sometimes I really don’t like you.” is my only reply to the terrible things I’m saying to me. Fortunately, to break the crushing monotony of child rearing, Cameron’s father and step mother visited for the week. For a few hours they would sweep in and spend the majority of their time cooing at Logan and playing with his toes, allowing us the restful opportunity to do household chores and make small talk. It was a good visit. Glenn and Lori don’t get out to Vegas often enough and they seemed pretty smitten by our fair boy. We even went out for Logan’s first night at a restaurant. A completely successful visit to Ventanno’s, a local Italian eatery with good veal piccata. 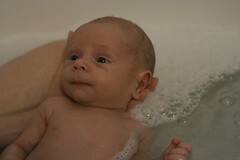 For the curious, we weighed Logan this afternoon, and his weight was up to 8lbs 12oz. That’s good progress. On Friday we loaded up the wagon and headed out to the other end of the valley to the pediatrician’s office. 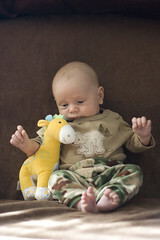 There must be pediatricians closer to our house, but this is the one recommended by our midwife. At times of great danger and need, some parents have lifted great weights or fought off large predators for the sake of their children’s health. Me? I willingly drive 30 minutes on the highway to patronize a pediatrician whose office is NOT convenient to my house. That’s just how I roll. Sacrifices. 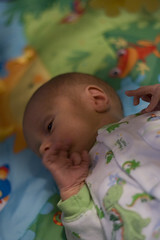 The good news is that Logan’s weight was up to 7lbs 7oz, which is above his birth weight. We weighed him again at Well Rounded Momma this afternoon and he was up to 8lbs. He appears to be averaging a little over 2 ounces a day in weight gain, and this has everyone real excited. And relieved. Monday night was his first month birthday. 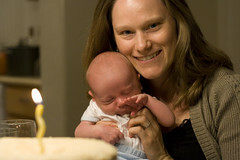 Our sister in law, Elizabeth, tells us that we have to have a birthday celebration for him every month the first year. She says it’s a Philippine thing. Who am I to argue with the Philippines? Besides, it’s not like we pass up a chance to entertain around here. Cameron and Grandma made a space cake with burnt butter frosting to mark the occasion. Not pictured here is the dinner I made to preface the cake; pecan and panko encrusted tilapia with sweet peas simmered in garlic onions and sauvignon blanc, and four cheese macaroni casserole with crunchy top. Monday we returned to the Pediatrician’s office to meet with the new lactation consultant again. I won’t keep you waiting, the results were very positive. Logan’s weight is up to 7lbs 1oz. 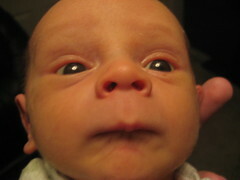 This means that for the first time, he’s above his birth weight. There was a considerable amount of relief from all corners at this news. Not satisfied with that success, Logan went on to perform several other notable achievements this week. 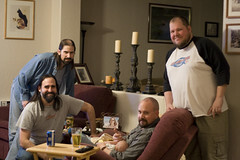 On Monday he sat down with his poppa, Jeff, and the Fillbach Brothers to watch his first Monday night football game. It was hard to gauge his interest. He certainly enjoyed the attention he got, and the Fillbachs seemed impressed with how little he cried. These are good signs. This morning Logan had a diaper malfunction. This is not a first occasion, several times in the past he’s managed to somehow pee out the edge of a diaper. 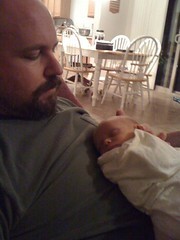 This was, however, the first time he managed to poop out the backside of the diaper. 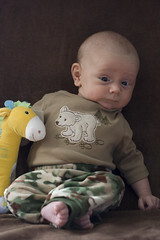 His cute little outfit and the blanket he was laying on managed to get the worst of it. 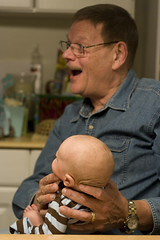 During the changing, he put up quite a fuss and managed to piss right into his own open mouth. He didn’t think that was as funny as we did. 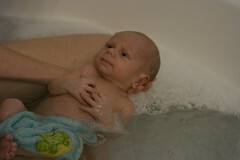 All that excitement precipitated his first bath. He seemed to regard bathing with all the curiousness and skepticism of a Viking sat to dinner with the Queen of England. Logan’s weight took another dip early last week. This was a bit of a blow to everyone. We were doing everything we were supposed to be doing, and nothing seemed to be working. In the middle of the week, we got a call to come into the center to meet another lactation consultation. Our third, if you’re keeping track. She unwrapped our boy from his swaddle, oh’d and ah’d over how cute he was, then expressed immediate concern over how skinny he was. Within a matter of a few short minutes of first meeting us, she noted that his tongue was tied. She wasn’t suggesting that he couldn’t turn a phrase, but rather that he had had the congenital abnormality of Ankyloglossia. This evidently isn’t that unusual in infants, and isn’t a big deal if noticed early. It can cause complications with breast feeding though, as the frenulum can prevent proper tongue movement if it’s anchored too close to the tip of the tongue. That alone could have been responsible for the complications we were facing, but she wasn’t done with the miracle diagnosis yet. 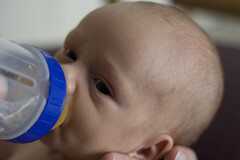 Less than 10 minutes later, she also noted that Cameron suffered from the congenital abnormality of Breast Hypoplasia. Again, this is something that isn’t necessarily a big deal, but it can prevent the mother from generating an adequate milk supply. These two minor problems combined to create a complicated situation. 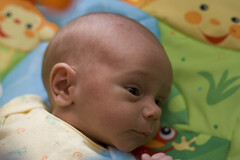 Our already advanced feeding schedule was further advanced, and we are now supplementing with formula regularly. 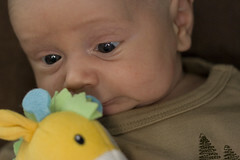 The next day we saw a pediatrician who performed a frenectomy, a brief procedure that clipped the frenulum under Logan’s tongue. The day after that we saw the new lactation consultant again. 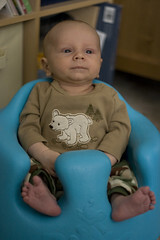 The good news in all this is that with an increase in feeding, and regular supplementing with formula has increased Logan’s weight regularly. His appetite has increased and his clothes even seem to be fitting better. We have another followup appointment with the lactation consultant on Tuesday, and everything appears very encouraging at this point. So encouraging that we were in good spirits for Halloween. Logan is too young and small for a proper costume. 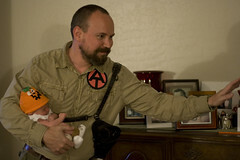 Too late I thought of the perfect costume for both of us, the character of Alan from Hangover, who spends a portion of the film carrying around an infant in a carrier. Instead we just but an hat on him that looked like a jack o lantern. 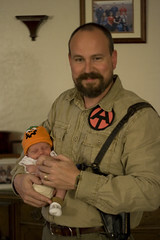 I chose to dress up as Adventure Team GI Joe from the 1970s line of GI Joe toys. Here’s a photo of me doing a bad Heisman Trophy pose using Logan as a football.